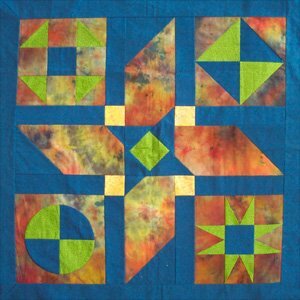 Boot camp for quilters—but so much more fun! Whether you’ve never quilted before or you want to become more accurate, this is the class for you. Get comfortable with hand and machine piecing and appliqué techniques, paper foundations, rotary cutting, mitered corners, drafting, and templates. Perhaps most important, learn how to troubleshoot and compensate for human error. Do your homework and you’ll leave class with a completed sampler top. Set-in pieces—and how to avoid them. Five 1-yard cuts of 100% cotton calico-weight fabric that coordinate with one another. Good to have a variety of values (light, med., dark) and sizes of print, but choose what speaks to you. Before you come to class, please prewash your fabrics in hot then dry and press them. Be sure to completely unfold them before throwing them in the washer. Sewing machine with spare needles and accessories. Thread in neutral color (tan and medium grey work well). Hand-sewing needles, seam ripper, pins, thimble if you use one. Very sharp pencil or fine-tipped fabric pen or pencil that will show on all your fabrics (you might need more than one color if you have very dark fabrics). You might want to bring a pencil sharpener as well. Template plastic, empty cereal box, cardboard back off a large paper pad, or manila folders for making templates. Fabric shears and paper scissors (you don't want to use your fabric shears on the template materials!). Rotary cutter, ruler, and mat (you may borrow the instructor’s during class if you do not own these already). Pen or pencil and paper for taking notes. Handouts will be provided as well. Gallon zip-lock bag with your name written on it. Requirements: Basic working knowledge of your sewing machine. Instructor Bio: Artist, instructor, and writer Cindi Huss creates quilted art, beautiful hand-dyed fabric, patterns, and note cards in her Kingsport studio. She has published articles in Quilting Arts Magazine and American Quilter. "Labyrinth II" quilt was accepted into the International Quilt Study Center's permanent collection in a group of small pieces representing art quilts in 2010. "Labyrinth" hangs in the V.O. Dobbins Community Center in Kingsport, TN.